What does a Coalition Government mean for us? With an ALP win in the Federal Election now paying $12.50 it seems almost certain that come Saturday we will have Tony Abbott as Prime Minister. This is not good news for firefighters. Whilst Abbott’s Coalition have been running a small target strategy in this campaign they have let their mask slip enough to show that they will make widespread cuts to fund their election promises. 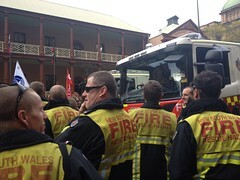 These cuts, like those the O’Farrell NSW Government has already made, will gut the services we all rely upon. And while they haven’t made their industrial relations plans public yet, it is obvious that in government they will be hostile to unionised workers like us. Consequently, the Union’s State Committee of Management has resolved to encourage FBEU members to vote either Labor or Green this Saturday. This is particularly important in the Senate. The last time the Coalition had control of both Houses of Parliament, John Howard introduced WorkChoices. So please, think about your vote and make it count. An Abbott Government will be no good for workers, and an Abbott Government with control of the Senate will be a disaster for all of us. via 2013 Election Statement | FBEU.